Since some of you might want to use this modified Nemo in Unity, I uploaded it along with its extensions to a PPA, so you can easily install and use it under Unity. Nemo comes with quite a few extensions ported from Nautilus, such as: Fileroller (File Roller integration), Compare (context menu comparison extension), Dropbox (Dropbox integration for Nemo), Media Columns (displays PDF and audio - mp3, WAV and FLAC - tags as well as EXIF metadata to the Nemo list view), Pastebin (extension to send files to pastebin), RabbitVCS (extension for RabbitVCS integration, a tool that provides access to version control systems such as SVN), Seahorse (extension for Seahorse encryption in GNOME) and Share (extension to share folders using Samba). All these extensions are available in the Nemo WebUpd8 PPA. 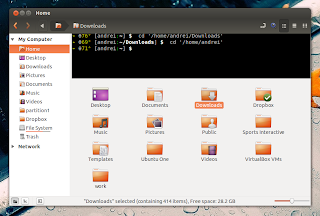 One extension is missing though: Sushi (a port of the GNOME Sushi extension to Nemo), because I didn't have time to remove its Cinnamon dependencies. Note that Nemo from our PPA is provided as is, without any guarantees. I'm not a developer and while I was able to fix some minor / easy to fix bugs in the past, I probably won't be able to fix any bugs you may encounter (contributors welcome). If you encounter non-Unity specific bugs, report them upstream. Warning: do not use this PPA if you're using Linux Mint or if you use Cinnamon in Ubuntu! 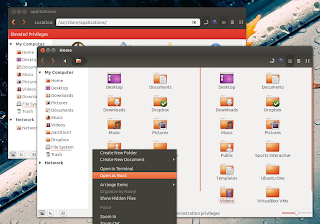 Also, if you've added any Cinnamon PPAs, remove them before using the WebUpd8 Nemo PPA even if you didn't install Cinnamon, or else the Nemo version in the WebUpd8 Nemo PPA might be overwritten. To launch Nemo, search for "Nemo" in Dash - no application called "Nemo" will show up but instead an application called files should be displayed - that's the app you need to launch. Don't search for "Files" because that will also find Nautilus (which is also called "Files"). 2. Optional: Enable thumbnails for files larger than 1 MB. By default, Nemo only displays thumbnails for files smaller than 1 MB. 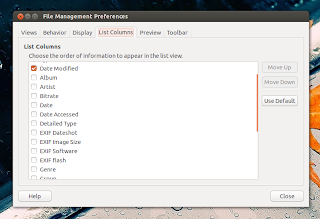 To change this, from the Nemo menu select Edit > Preferences and on the "Preview" tab, under "Other Previewable Files", set "Only for files smaller than" to the size you want. If you're having a problem installing nemo-dropbox, see THIS fix. Tip: the embedded Nemo terminal can be hidden using F4. You can disable it on Nemo startup and change various settings via Dconf Editor ("sudo apt-get install dconf-editor"), under org > nemo > extensions > nemo-terminal. 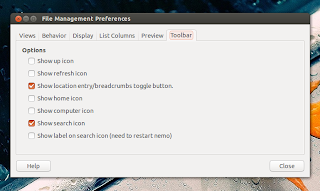 Then, start Nemo (or log out and log back in) and it should draw the desktop icons instead of Nautilus.